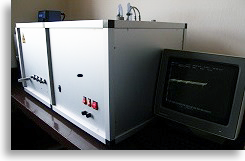 This equipment serves for measurements of weight average molecular weight (Mw [g/mol]), radius of gyration (Rg [nm]) and second virial coefficient (A2 [mol cm3/g2]) of polymers in aqueous and non-aqueous solutions. It was manufactured by SLS-Systemtechnik, Germany and is a new construction based on a Fica 50 static light scattering device using its main parts like mechanical and optical components. The new design is a compact stand alone instrument, here equipped with a DPSS-laser type Uranus (532 nm 5mW), a DOS based internal computer and software for measurement and data validation. The optical and mechanical concept is that the adjustable laser beam passes a reference optic and enters an index matching bath - a vat filled with toluene. Inside this vat, the round sample vial should be placed with a specially designed holder. The scattered light is detected with the aid of a classical goniometer construction, which can be placed at angles 15°-145° (the detector is turned around the center of the scattering vial). The reference and scattering signal is detected by photomultipliers (Hamamatsu, R928). The signal processing bases on real signal integration over pre-selected time periods depending on the signal strength, which is controlled by the synchronous monitored reference. This concept leads to stable averaged - static - results where the main error sources (drift of the laser intensity or the high voltage to set the amplification of the photomultipliers and drift effects of the processing electronic circuits) are canceled. If you require further information on this or other modifications of SLS or DLS instruments please contact Mr. G. Baur.